The sign, which looks like it was made in Microsoft Word, reads, "Rockland Coaches 11A, 11C, 20, and 42 Bus Routes NO LONGER SERVICE THE NANUET MALL. 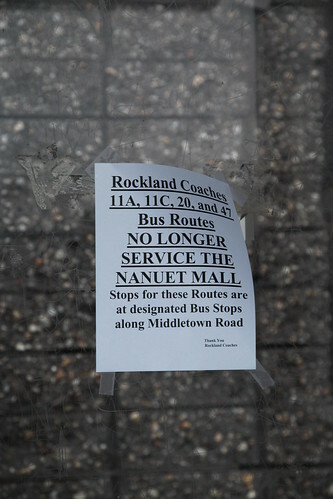 Stops for these Routes are at designated Bus Stops along Middletown Road. Thank you, Rockland Coaches."